Buy Ban Toxic Sunscreens a Coffee. ko-fi.com/bantoxicsunscreens - Ko-fi ❤️ Where creators get paid by fans, with a 'Buy Me a Coffee' button. Aloha, welcome to our ko-fi page! 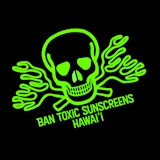 We spend all our free time educating in Hawaii & beyond about the dangers of chemical sunscreens for people, corals, marine life. Help us save Hawaii's coral reefs!!! Secured Payments. Support goes to Ban Toxic Sunscreens's account. Upgrade Ban Toxic Sunscreens to a yearly Gold Membership with a one-time payment.